YANGON, Myanmar — She was seen as a beacon of democracy whose unflinching stance against Myanmar’s brutal dictatorship and years under house arrest saw her honored with a Nobel Peace Prize. But Aung San Suu Kyi, who as "state counsellor" is now Myanmar's de facto leader, is facing increasing international criticism over the treatment of the minority Rohingya Muslim population amid a bloody crackdown following attacks by insurgents. The military has said nearly 400 people, most of them alleged insurgents, have died in the recent violence and accused the militants of "terrorist" atrocities against non-Muslim civilians as well as burning down their own villages. 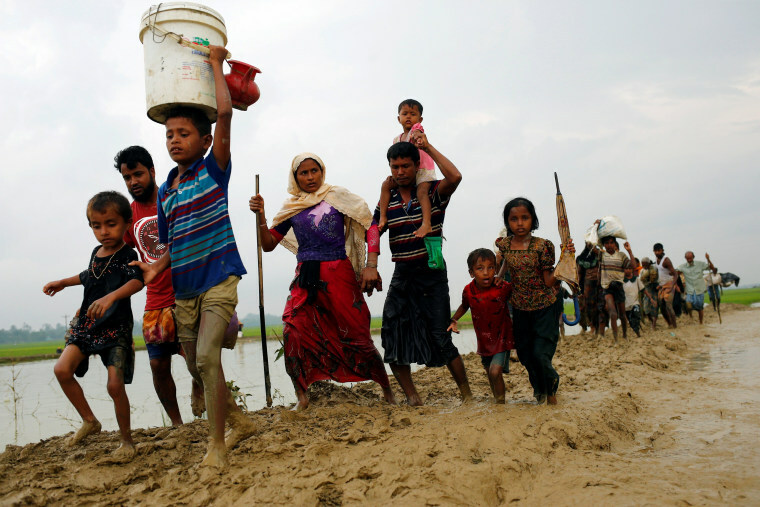 The violence has triggered a flood of Muslim Rohingya refugees from the predominantly Buddhist country. The UNHCR on Tuesday said 123,000 people had fled into neighboring Bangladesh since Aug. 25. Aid agencies say that some had suffered bullet wounds. Some Rohingya have alleged atrocities including children being beheaded and a group of men forced into a bamboo hut before being burned alive. International media and independent observers are barred from the area and NBC News has not been able to verify such accounts. "My two nephews, their heads were off. One was 6 years old and the other was 9 years old"
On Friday, Turkish President Recep Tayyip Erdogan branded the deaths of Rohingya in Myanmar as "genocide," but that claim has been rejected by international experts. Last year, a UN official told the BBC that the government had an "ultimate goal of ethnic cleansing of the Muslim minority in Myanmar." And Malala Yousafzai, the youngest person to win the Nobel Peace Prize, on Monday said on Twitter she is was waiting for Suu Kyi to condemn the "tragic and shameful treatment" of the Rohingya. While the human-rights icon has previously been accused of remaining “silent” when it comes to abuses against the Rohingya — who are largely denied citizenship or freedom of movement by Suu Kyi's government — statements and graphic images that have been published by the State Counsellor's Information Committee are now facing scrutiny. Suu Kyi rarely speaks in public so that body is often the only guide the public has to her opinion on key issues. Some of the social media posts by the information committee were accused of promoting hate speech — including the use of the term "extremist Bengali terrorism," which is considered inflammatory. Others attempted to link international aid groups to terrorism. Phil Robertson, deputy director of Human Rights Watch's Asia division, described Suu Kyi as "part of the problem." He added: “There are only so many times even someone like her should receive the benefit of the doubt." Robertson also accused Suu Kyi of "reckless statements and using on her website the same language of anti-Rohingya extremists she previously decried." The violence erupted when a group calling itself the Arakan Rohingya Salvation Army (ARSA) launched deadly attacks in what they said was a defense of the Muslim minority who are largely denied citizenship in Myanmar. There are approximately 1.1 million Rohingya in the country. Armed primarily with knives and homemade explosives, ARSA killed 12 police officers, a soldier and an immigration officer. In response, the military unleashed what it called "clearance operations" to root out the insurgents. Satellite imagery analyzed by Human Rights Watch shows hundreds of buildings have been destroyed in at least 17 sites across Rakhine state since Aug. 25, including some 700 structures that appeared to have been burned down in just the village of Chein Khar Li, the organization said in a statement issued Saturday. The government blames the insurgents for burning their own homes and killing non-Muslims in Rakhine. Longstanding tension between the Rohingya Muslims and ethnic Rahkine Buddhists erupted in bloody rioting in 2012, forcing more than 140,000 Rohingya into displacement camps, where around 100,000 still remain. The military said most of those killed were militants, but army representatives and the government have both said security forces are finding it difficult to distinguish between insurgents and ordinary Rohingya villagers. ARSA is also accused of killing members of the Rohingya community it believes are informers. Suu Kyi's government regards most Rohingya as illegal immigrants from Bangladesh even though many have lived in Myanmar for generations. It also has portrayed the ARSA attacks on the security posts as a full-scale assault on the country by foreign terrorists. Following the Aug. 25 attacks, Suu Kyi’s information committee published a photo online of World Food Programme (WFP) energy biscuits which the government claimed had been found around a month earlier at an abandoned “terrorist training camp." The innocuous image of the distinctive WFP blue packets was followed — without warning — by a picture of a child with half her face missing, then other gruesome photos of the bodies of adults and children disfigured with what looked like bullet wounds. They had allegedly been killed by ARSA. A statement that accompanied the photos also alleged that international NGO workers had been spotted helping ARSA surround a non-Muslim village. Further allegations and pictures attempting to link WFP and other NGOs to supplies used by ARSA were published in the days that followed. Referring to the social media posts, WFP said it "takes any allegations of food diversions very seriously and considers any manipulation of food assistance destined for needy families as theft." It added that it had requested more information from Myanmar authorities so it could investigate further but "these details have not yet been provided." WFP also stopped delivering aid supplies in Rakhine citing fears over “insecurity." Around 250,000 vulnerable people in the state are estimated to have been affected — including large numbers of children already living on the brink of starvation. Amid the controversy, State Counsellor’s Information Committee last week dropped the term "state counsellor" — the Nobel laureate's title — from its name. Observers point out that Suu Kyi ultimately has no control over the powerful military's activities on the ground. The armed forces are run by Commander-in-Chief Min Aung Hlaing. And while Suu Kyi won the country's first democratic election in decades two years ago, the military is guaranteed 25 percent of seats. It also continues to run ministries including security and border affairs. However, Suu Kyi's ability to sway public opinion is well recognized. “[Suu Kyi's] management style is very hands on; it seems unlikely that anyone in her administration would publish this kind of material without her assent,” said Mary Callahan, associate professor of international studies at the Henry M. Jackson School of International Studies at the University of Washington, and an expert in post-military reform in Myanmar. “Our intention [in changing the name] is very clear. To show the committee represents all the government — not just the state counsellor,” he told NBC News. Fiona MacGregor is a journalist based in Yangon, Myanmar. She is a former features editor of The Scotsman, and has worked as a freelance journalist across Southeast Asia for the past six years. Her work has appeared in publications including The Telegraph, The Guardian, The Times, Marie Claire, Nikkei Asian Review, Aftenposten, Repubblica, Geographical Magazine, and Foreign Policy.